At least half a dozen of my friends (including me) have curly hair and I swear you wouldn’t know that. Thanks to all the heat styling arms that result in sleek and straight hair. But, whenever I see a girl rocking those au naturale curls perfectly, I can’t help but stop and stare. And the curiosity kicks in – how does she look so damn good? One such girl crush has to be Taapse Pannu. This girl really knows her curls. So, to get some secret tips and tricks from the girl herself, I tapped Taapsee to share her styling advice with BarelyVogue. She was generous enough to agree and gave me great tips and spoke about some of her favorite products. Read on..
BV: You have such beautiful hair, what is the best thing about having your hair? Taapsee: (Smiles).. I’ll tell you frankly, the best thing is that I don’t have to do anything with it when it comes to styling. I’ll just leave it and won’t have to worry about pinning it up or styling. I’ll just open my curls and walk out. If I just tie them up in a most shabbiest way possible, still my curls will look good. They are meant to give you very rough and raw look. That’s the best part of having my hair. BV: Have you ever wished you didn’t have curly hair, at least as a kid or in your teenage? Taapsee: Oh! you have no clue what I’ve gone through. I come from a sikh family. I’ve never cut my hair until I was in the 9th standard, even then I just trimmed it. It was so controversial at home then (laughs…). Maintaining my hair was such a tedious and elaborate process, every sunday I had to oil, wash, detangle and let my hair dry. I used to hate it. I was such an energetic kid growing up, I used to hate that it took so much time. In my 12th standard, I got it permanently straightened twice. It made me kind of sad because all those chemicals damaged my hair and made it look lifeless. BV: When did you start embracing your curls then? Taapsee: Not until 2008. When I reached Miss India first time I gave a thought about how I look. That’s where I learned to take care and maintain my hair. There I’ve started loving my hair, now I constantly preach to everyone with curly hair to love their natural curls and not to process it much like I did. BV: Tell us about your hair care routine. How do you take care and style your curls? Taapsee: I wash it every other day or so, the process I follow is intensive in a way. I oil it the night before or right before I wash my hair. I have been using kerastase shampoo and conditioner ever since I made peace with my curls. The list does not end here, after the shower I towel dry, until water isn’t dripping. When it is still slightly wet I use a leave in conditioner and moroccan oil. You should choose the products depending on your density. Since I have so much density, serum’s won’t work, so I use this Moroccanoil intense curl cream and put some more Moroccan oil on the roots if I am styling. And I finish of with anti-frizz serum. I am not particular with the brand when it comes to anti-frizz serums, I used to use kerastase before but now I use Loreal. BV: Do you ever use dry-shampoo’s to quickly fix after work-out hair? Taapsee: I don’t, I have to wash my hair frequently to keep it sane. BV: Being an actress you are constantly exposed to chemicals, sun and pollution. 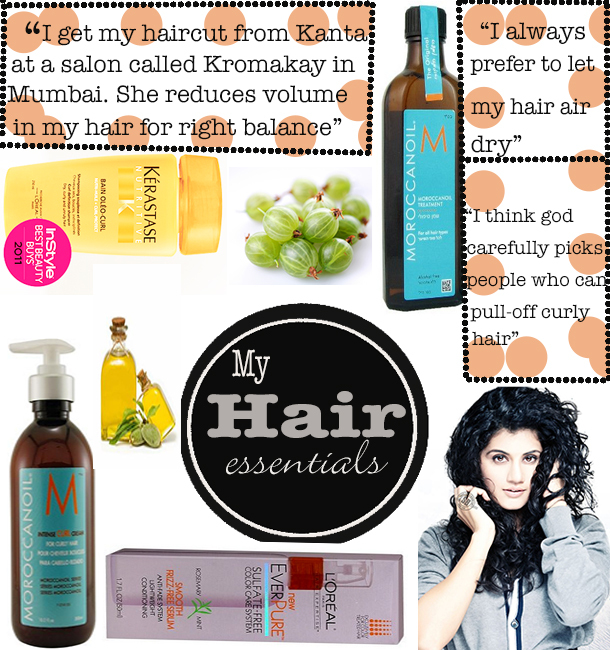 Do you have any hair indulgence to pamper your mane? 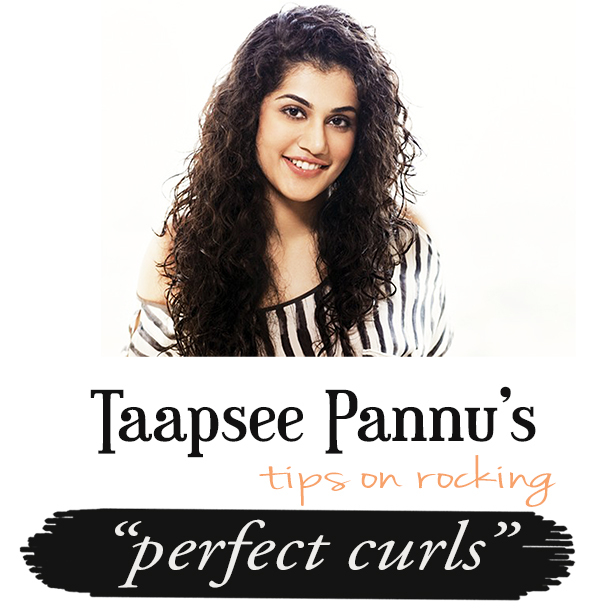 Taapsee: I frequently oil and use various combinations of coconut oil, amla oil, almond oil and olive oil. I also visit hair spa at least once a month. If you are regularly oiling your hair once a month is more than enough. 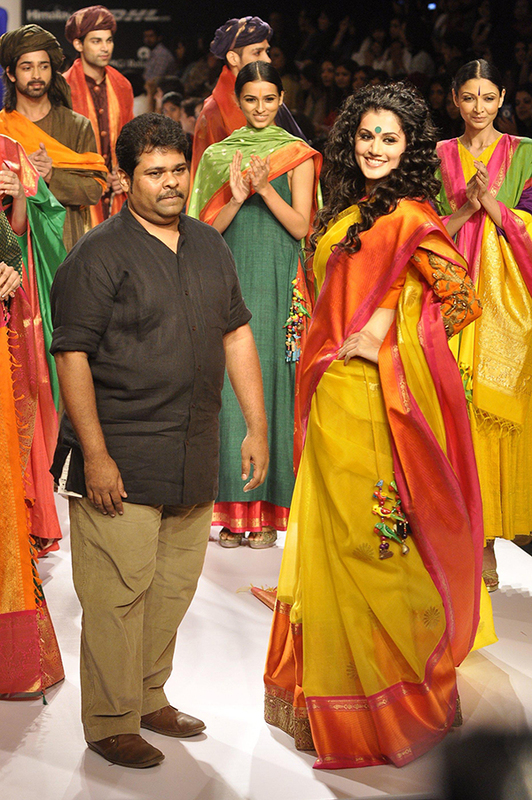 BV: I loved your look when you walked for Gaurang in Lakme Fashion Week. You were very graceful and your hair added so much element to that look. Taapsee: Oh thank you! he always prefers to shoot my looks without any makeup and hair styling. He doesn’t like any hairstyling. Sometimes I tell him I should at least wear kajal to not to look like I just woke up. images via googleimages and santabanta. I have thick and frizzy curly hair, didn’t know how to manage it. this information was of great help. Thank you.